Legendary Russian icebreaker and polar pioneer, the mighty Kapitan Khlebnikov, makes its anticipated return to navigate uncharted terrains. Purpose-built and designed to maneuver through dense pack ice, the ice-class Khlebnikov provides unparalleled access to the most remote areas of the Arctic, as well as extraordinary opportunities to flight-see on two on-board helicopters. The first vessel to circumnavigate Antarctica and holding the record for the most transits of the Northwest Passage, Khlebnikov is one of few passenger carrying polar-class vessels that combines power and technology with comfort. Enjoy an exclusive chance to experience this engineering and technical marvel up close. Quark team members are all polar-passionate and seasoned veterans with rich backgrounds in marine biology, history, geology and more. Quark offers one of the highest staff-to-guest ratios in the expedition world. And that means more expert guidance for your trip-of-a-lifetime! Here are some of the Expedition Heros you'll meet on your Arctic Icebreaker Expedition onboard Kapitan Khlebnikov. 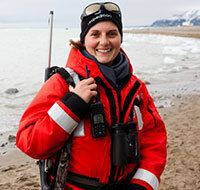 Cheli has been employed in the expedition cruise industry for the past 16 years specializing in the Polar Regions. 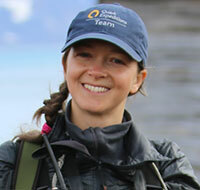 She has also worked as a Field Assistant for TVNZ Natural History unit working on a number of documentaries. Cheli was last on board the Khlebnikov in 2009 and remembers her experience as ‘the pinnacle’ of her long career in this industry. Born and raised in Salzburg/Austria, Andrea worked for four years as project manager in Vienna, organizing events and incentive projects across the world: from Dragon boat competitions in Shanghai to ice-rallying and dog sledding in Finland and also camel racing in the Sahara desert. But it was her first trip to Antarctica that awoke her passion for the Polar Regions. Since 2011, she has been sharing her enthusiasm and respect for these sublime but fragile regions with fellow passengers on Expedition ships in her maternal German as well as in English, Spanish and French. She also worked as Assistant Expedition Leader and Naturalist on Expedition Cruise ships sailing around the British Isles; following the West coast of Africa from Cape Town to Agadir and conquering the islands of the South Pacific. When not working on Expedition ships, she very much enjoys traveling and discovering the world, especially on horseback. She rode through Quebec maple forests, the Rajastani Thar desert, the Upper Tauern mountain range and Iceland. She took the Trans-Siberian Railway from Moscow to Vladivostok and spent last summer exploring interior Yukon & Alaska in a 1989 Toyota truck. When back at home in Austria, Andrea works as voluntary Emergency Medical Technician with the Red Cross. Hailing from South Africa, Pam is a marine scientist, PADI dive instructor, zodiac skipper and sailor, and has worked in and on the ocean just about every day for the past 15 years. She has participated in several marine research cruises, has published 3 APPS for smartphones on sharks & rays and whales & dolphins and Antarctic Wildlife, and enjoys teaching people about the oceans and conservation through her travels. 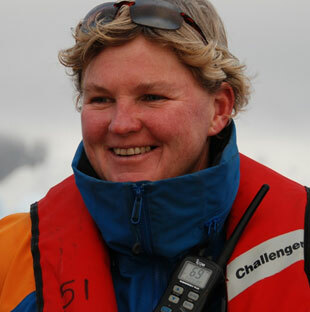 Pam started expedition cruising in 2008 and has now been almost everywhere a small cruise ship can take you; 110 countries from the poles to the remote reaches of every ocean – loving life as a citizen of the sea. When not at sea – Pam is a beach bum in her home town of Umdloti. 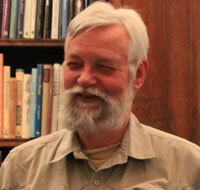 Norman P. Lasca is Professor Emeritus of Geology at the University of Wisconsin-Milwaukee. He holds degrees from Brown University and the University of Michigan. Widely traveled, he has worked extensively in the Arctic and Sub-Arctic areas surrounding the Arctic Ocean and Antarctica for over 50 years. He is a widely published scholar and editor whose expertise lies in Earth-surface processes, especially those related to glaciers and glaciation. His recent research has dealt with the glaciation of Russia's Siberian coastal region and with erosion problems in the US National Forests of the upper Midwest. He serves on several national and international geological commissions, as well as on non-profit boards and on technical advisory committees for various municipal and state agencies. He is a licensed Professional Geologist and Professional Hydrologist, and is a Fellow of the Geological Society of America. 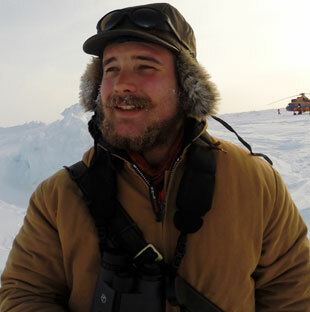 In addition to his geologic work, his interests include ornithology and Arctic botany. 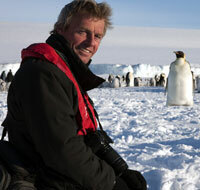 Bob Headland is a Senior Associate of the Scott Polar Research Institute, University of Cambridge. His principal interests involve historical geography and associated studies. Specifically, his work concerns human effects on Polar Regions - especially the smaller islands and archipelagos. The archival details and other historical records from earliest expeditions to recent events have allowed him to provide data for studies of long periods of climatic variation, glaciological and biological changes in Polar Regions. Bob is an advisor to several expeditionary organizations, departments of government, a Fellow of the Royal Geographical Society, and a member of the Institute for Historical Research of the University of London where he delivers lectures for several courses. In 1984, he was decorated with the Polar Medal and is a member of both the Arctic Club and Antarctic Club. 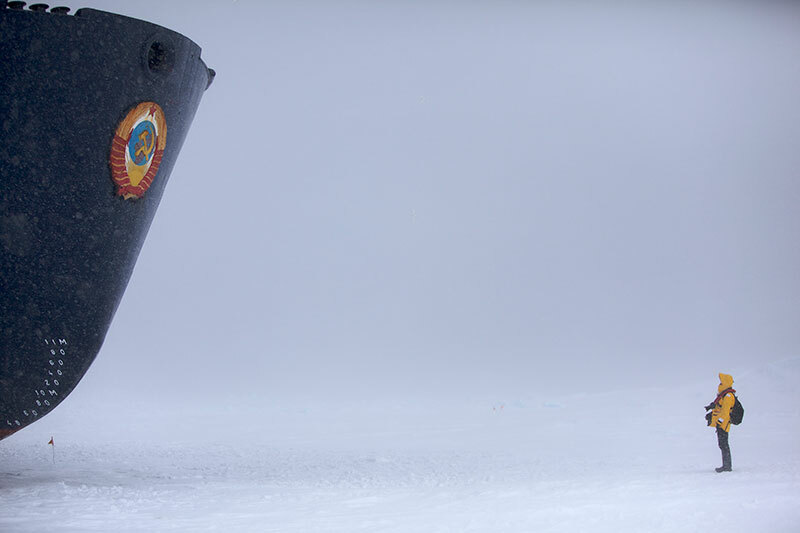 Bob has spent many years with Quark Expeditions, educating travelers on the history of polar exploration aboard icebreakers in the Arctic and Antarctic. During this time he has been associated with the conservation of the historical huts and related sites in both Polar Regions. Fabrice Genevois is a freelance biologist who lives amongst the volcanoes of the Auvergne region, in the central part of France. His polar experience goes back as far as 1989, when he spent 18 months working as a field researcher on seabirds and marine mammals of the remote Kerguelen Islands (French Subantarctic Territory). His detailed observations on the breeding behavior of the Blue petrel led to the publication of many scientific papers and his work was awarded with the Dplome de l'Ecole Pratique des Hautes Etudes in 1996 (Paris, La Sorbonne). In 1992, he began working as field guide and lecturer, leading French groups in Antarctic Peninsula and South Shetland islands, onboard the Quark Expedition icebreakers. From then on, he was deeply involved with polar tourism, leading groups to remote places of the Arctic and Antarctic. 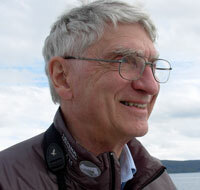 As a biologist, the main subject of his lectures is natural history, especially birds and mammals biology and ecology. 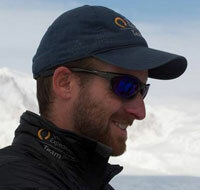 For the past 17 years, Fabrice Genevois has been travelling extensively in polar regions and is now familiar with remote destinations in the Arctic like the Northwest and Northeast Passages, the Canadian High Arctic (including Ellesmere Island), Greenland, Iceland, Svalbard, Franz-Joseph land and the Geographic North Pole. In the deep South, his expeditions led him to the shores of the Ross and Weddell Seas, the far side of Antarctica, the Amundsen and Bellingshausen seas, the Antarctic peninsula and the South Shetlands, as well as most of the remote Subantarctic Islands of the Southern Ocean. Originally from Lochgilphead in Argyll and Bute, Colin became fascinated with the mountains and glacial landscapes of Scotland earlier than he can remember. This love of the mountains and wild spaces drew Colin into academic study and he graduated from Edinburgh University in 2004 with an MA in Geography, having specialised in glacial geomorphology and physical geography fieldwork. This led straight into a season' working in Antarctica where Colin spent 5 months crewing on a British-led sailing and mountaineering expedition. With this experience behind him a desk job carried little appeal, so Colin joined the Royal Air Force as an infantry officer in 2006. However, missing all things glacial, Colin left the RAF in 2007 to re-commence his studies, enrolling as a Masters student in glaciology at Aberystwyth University. Several years later and Colin has now recently completed his PhD which focussed on surveying and better understanding the glacial landscapes of the planet Mars. He has also participated in fieldwork in the Himalayas and on the Greenland ice sheet, and has racked up many more hours of sailing time including a late season 3-man crossing of the North Atlantic starting in Nuuk, Greenland, and finishing in the Scottish town of Oban, not far from where Colin was born! When not sailing with Quark amongst the world’s most beautiful landscapes, Colin travels and writes about his experiences. Don't miss out on the chance of a lifetime aboard Kapitan Khlebnikov - where the science of exploration is just as riveting as the landscapes. 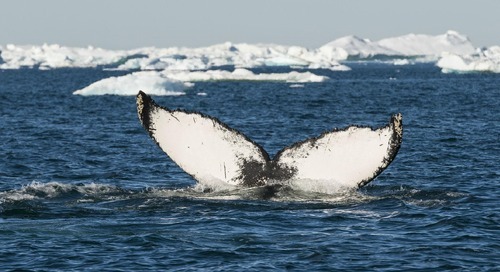 Contact an experienced Polar Travel Adviser today to book your Arctic Icebreaker adventure. Karina Taylor loves to travel, and for years she has been passionate about a Kapitan.